May | 2014 | We've Got Some Issues. 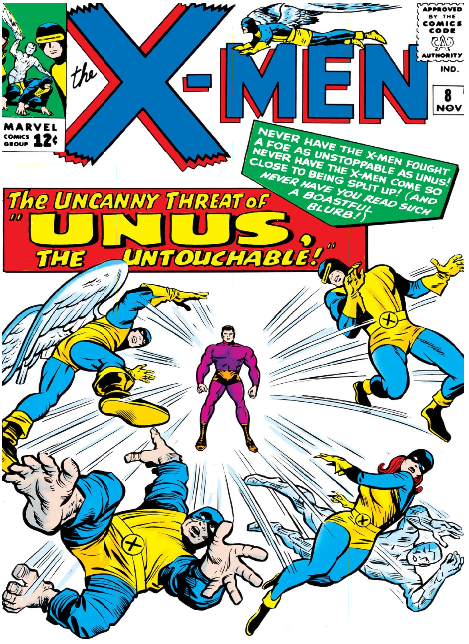 Central Conflict: The X-Men vs. Unus the Untouchable vs. (sort of) The Beast. 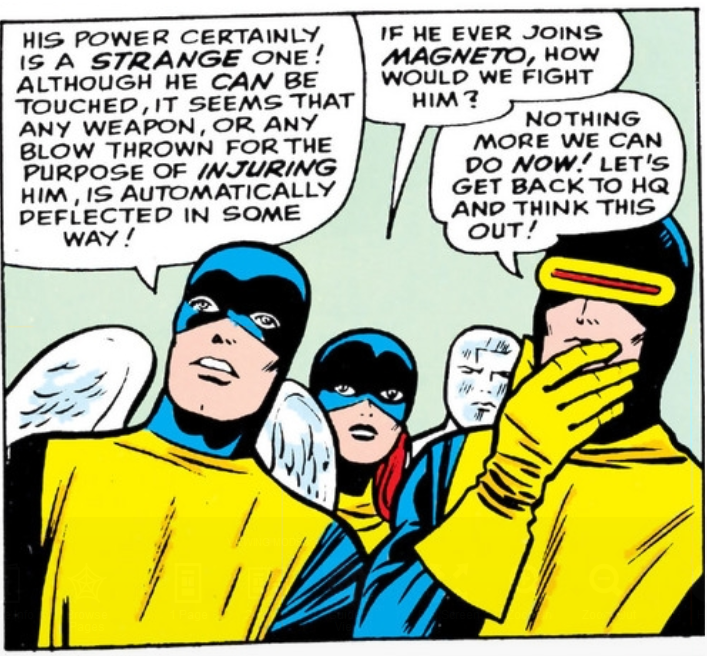 So how goes it for The X-Men without the stalwart and stoic Professor Xavier? Pretty well actually. Cyclops is holding it down as interim leader (he gets plainclothes privileges apparently). 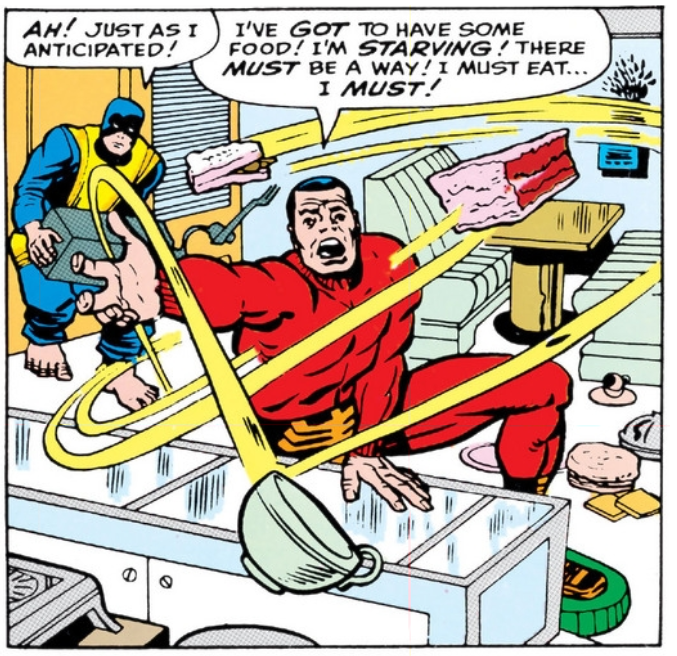 Coach Cyclops walks the Danger Room floor, reminding X-Men not to die as they flit and hurl themselves through the ever-confounding game of human Mouse Trap where they spend most of their time. But all doesn’t end well for our X-Men. 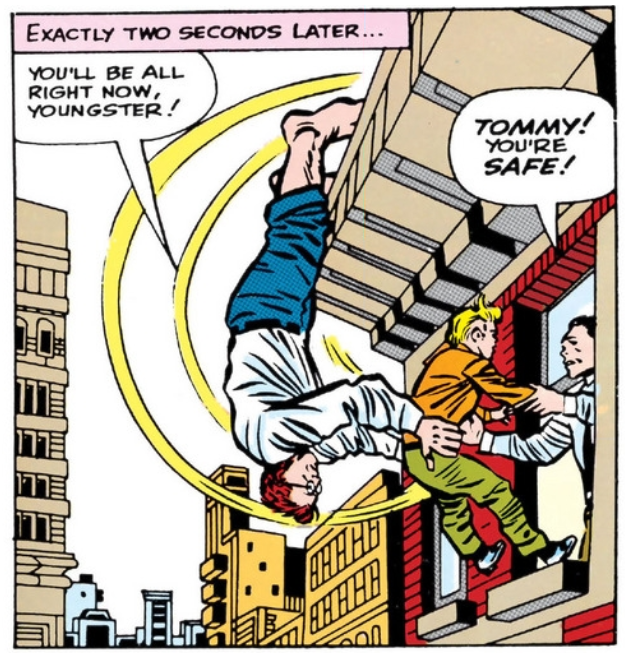 After revealing himself to be more than human, the mob (previously gathered to stare and worry after Tommy) turns on and physically assaults Hank, who runs and jumps away while covering his face. Nevermind that Hank just saved a boy’s life. He’s a mutant and so he must be mobbed by people who were, moments ago, going about their everyday lives. It’s unnecessary to put too much emphasis on this, but it is cool to see that, again, these mutants are just allegories for any minority, any marginalized group, any “other” who is suspect or worse on sight. This comment is about fifty years late but the texture of societal fringe here really does seem admirable for a funny book. The experience ruffles Hank. Fuming and maybe a little humiliated, he decides he’s had enough of defending a populace that hates and fears him. Scott tries to talk him down but without success. 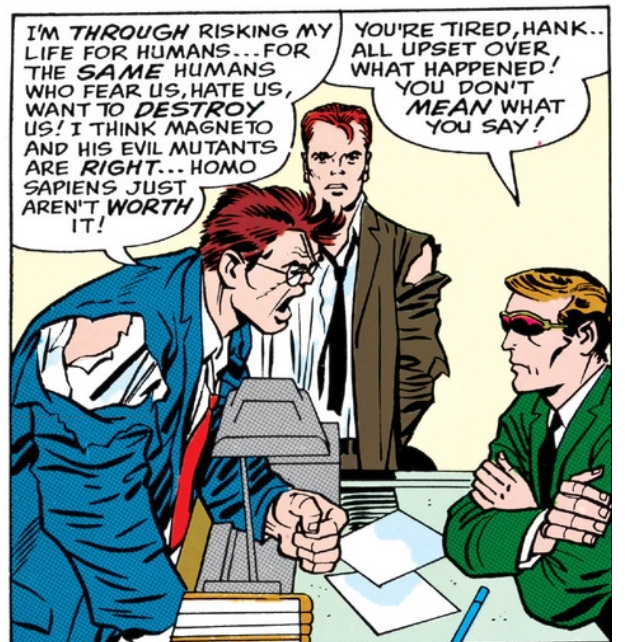 Frustrated and fuming, Hank storms off, leaving the X-Men and the life he knows. Scott, at a loss, reaches out through a hidden machine to contact Xavier for advice. 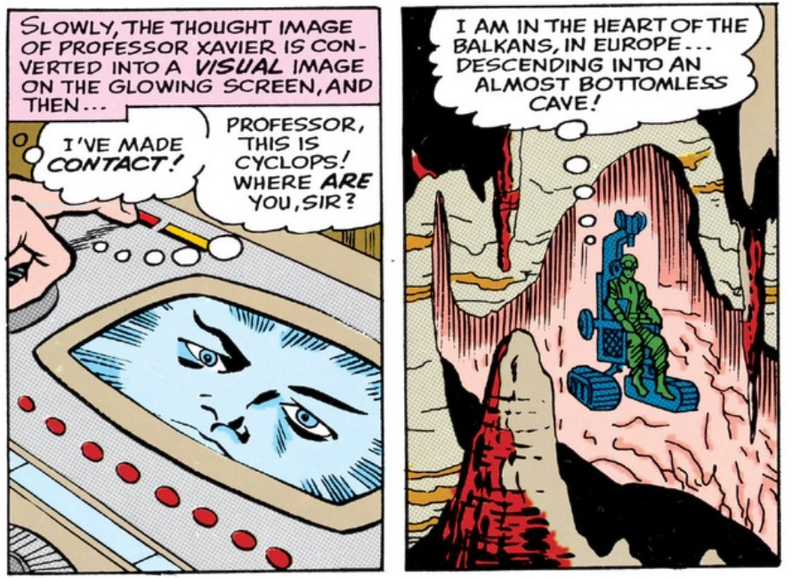 Xavier isn’t much help in this department because he’s busy spelunking in the Balkans in a motorized wheelchair rigged for caving. 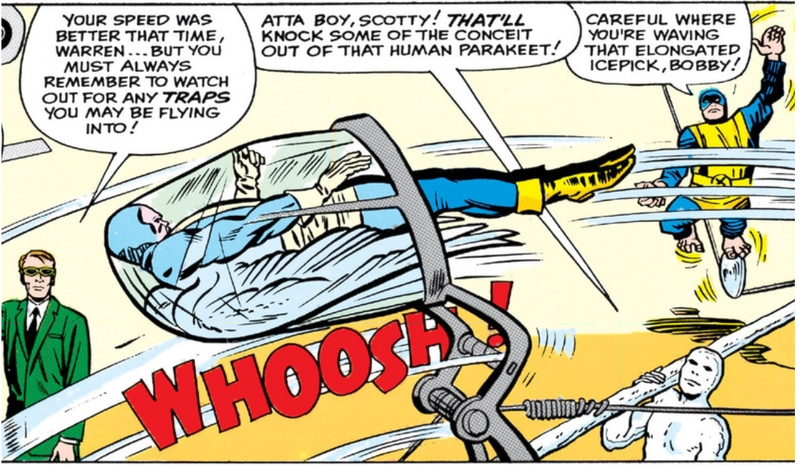 Xavier assures Scott that all will be well and to let Hank go for now—though he also offers almost no explanation to what he himself is up to. Here the narrative jumps ahead in time (how far is unclear) to Hank’s new, ex-X-Man life. Hanging up the hero costume, Hank begins his career anew as—what else?—a professional wrestler. 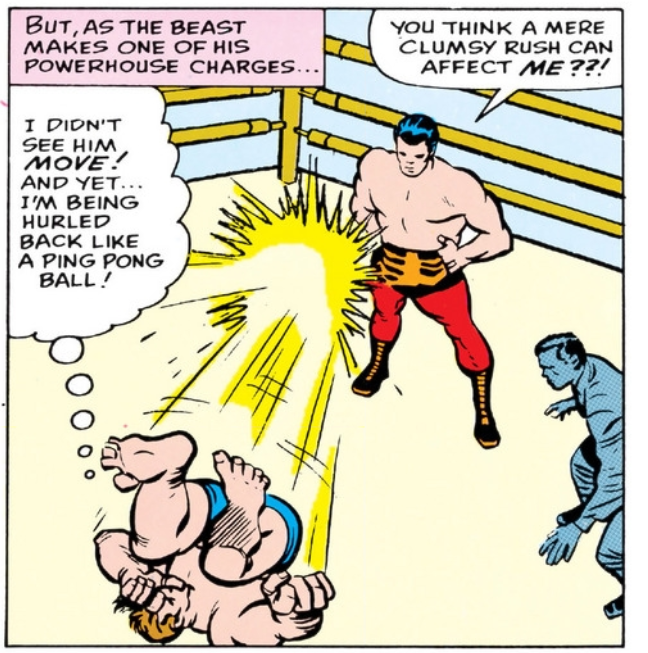 Makes a kind of sense: as a mutant with superhuman agility, toughness and the body of a gorilla, Beast would be an undefeatable contender in the ring. Except, Hank’s first match goes terribly. 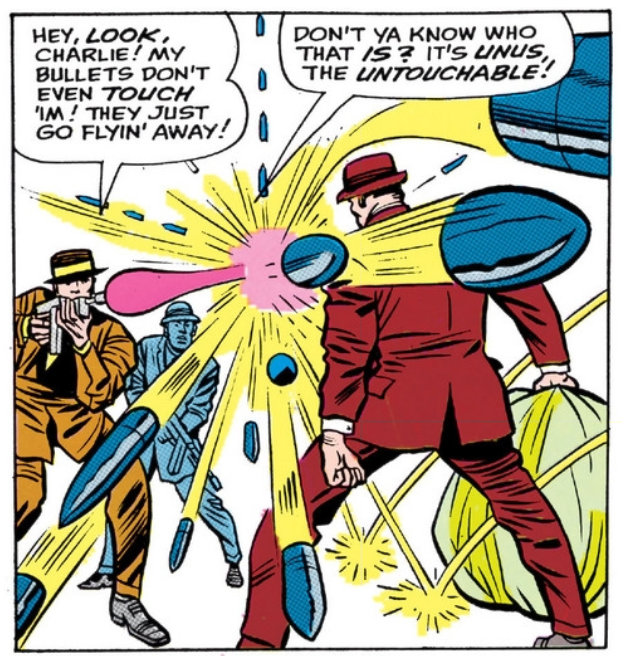 His opponent is—wouldn’t you know it—a mutant himself: Unus the Untouchable. Unus has the Unique ability to be not touched. Every strike and blow from Hank is answered with an automatic and unnegotiable deflection. Unus is pretty much wrapped in a force field. This power would be pretty useful for a team of supervillains, right? Unus thinks so. Turns out he’s been campaigning Mastermind pretty hard for a spot on the Brotherhood of Evil Mutants roster. But it’s not that easy, Unus needs to audition first. Like the boy trapped on the water tower, an opportunity to exercise his stuff comes along pretty conveniently when Unus finds himself walking directly into a violent bank robbery. Unus decides he could do with the loot himself and takes it from the robbers. How does Unus’ power really work you ask? How, when his power is automatic deflection, can he touch anything? How can he grab the money bag? How far does his power go? Why is he even capable of wearing clothes? Well, that’s just how his superpowers work, okay? Conveniently. Somebody else is asking these questions too. 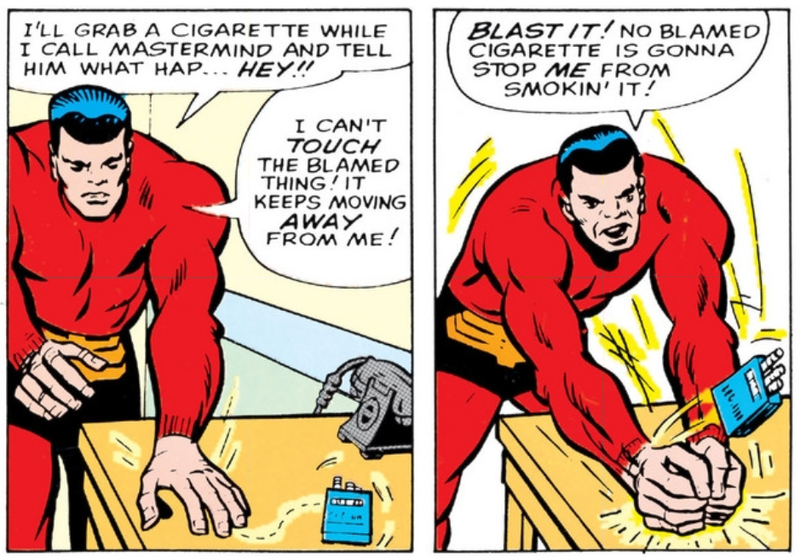 After Unus successfully robs the bank robber, he returns to his apartment where he finds Hank (back in his X-Man uniform) awaiting him with the business end a ray gun. The effect of the ray gun is instantly clear to everyone but Unus. 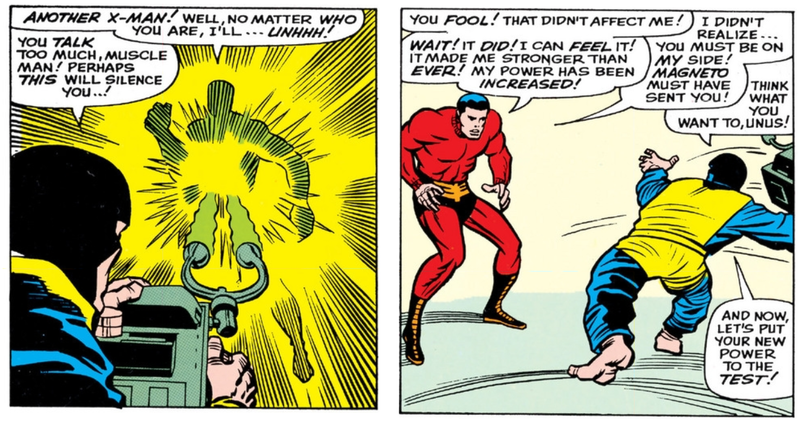 Taking a page from the Xavier playbook, Beast finds a way to turn the enemy’s power against him. By dialing up Unus’s Untouchability to eleven, Beast delivers the death stroke. 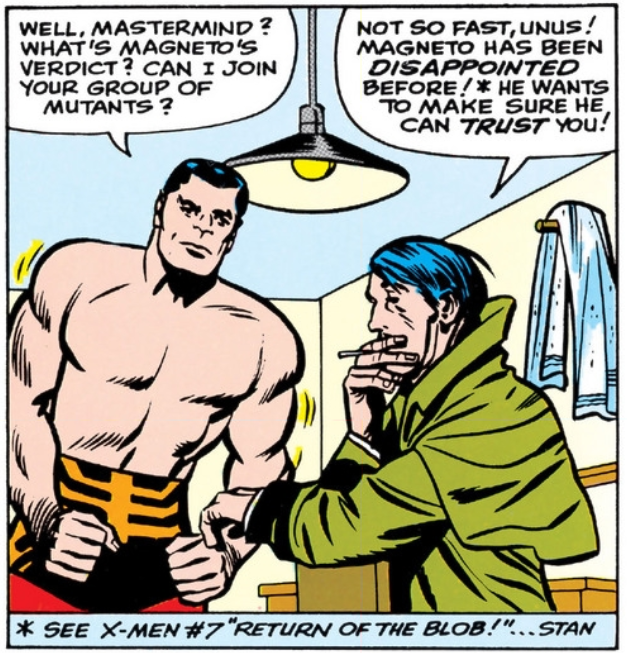 It’s unclear what brought Beast back to the team, but everyone’s glad to have him back in the fold (even though he just nearly damned a man to starve to death in front of them). So, no Magneto and a minimum of Xavier in Issue 8. But you know what? Their absence isn’t really felt. The focus on Beast feels organic and actually kind of balanced; unlike the case might have been in, say, Star Trek: this never really feels like a Scotty or a Bones episode. It reads merely like this just happens to be the unique jam the X-Men find themselves in this week. Maybe it’s the length of the book (thirty pages seems like a lot of comic), but these issues have actual narrative weight. Must be the jubilant art that makes ‘em feel so airy.